The mission of the Southern California Shakespeare Festival, SCSF, is to establish a classical, professional repertory Theatre Company, dedicated to nurturing artists, student-artists and enriching the diverse community of Pomona and the Inland Empire. SCSF endeavors to explore the eternal human questions seeking to enlighten and excite contemporary audiences with the timeless relevance of Shakespeare's literature. We are committed to providing our community with a professional theatre company of multicultural actors and students that will reach our diverse audience. SCSF's inaugural production of "King John" in 2005 played to sold out houses, as we have our 14 consecutive seasons: "The Winter's Tale," "The Merry Wives of Windsor," "Twelfth Night," "Much Ado About Nothing," "Hamlet," "Richard The Third," "The Tempest," "Midsummer Night's Dream," "Julius Caesar," "Macbeth,” “As You Like It," “The Comedy of Errors," and most recently, "Romeo and Juliet." SCSF has continued our wonderful collaboration with the Pomona community and the School of Arts and Enterprise (SAE) with performances of our productions at the SAE theatre in downtown Pomona. Student artists joined SCSF artists, along with a student artists from I-Poly High School and Pasadena’s Mayfield Senior School for Girls. We have continued our strong relationship with all. 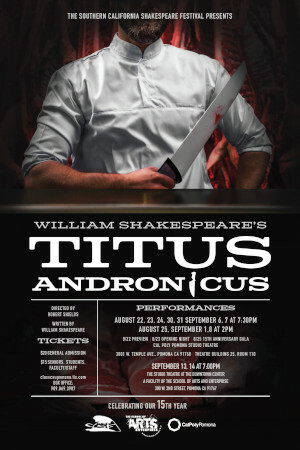 For Season 15, SCSF is performing William Shakespeare's “Titus Andronicus." We are partnering again with the School of Arts and Enterprise to present two shows touring to SAE starting on Sept. 13. SCSF thanks the Department of Theatre and New Dance, the University, The College of Letters, Arts, and Social Sciences, and the Associated Students, Inc. and our wonderful patrons for their support. Linda Bisesti, Artistic Director of SCSF, is a Professor in the Department of Theatre and New Dance, where she is the Head of Acting, teaching voice, acting and directs. She is a Designated Linklater Voice Teacher and a working professional of AEA, SAG-AFTRA.